With the success of one of Disney’s newest animated movies, “Brave,” lead character Merida has officially been crowned as the 11th Disney princess as of May 11, 2013. But here’s the catch: Merida got a makeover, and her new design is a bit slimmer and sexier, complete with the same gratuitous sparkles that bedazzle all other princesses in the lineup. A few days later, after angry backlash from Merida fans, Disney promptly revoked the new design. The problem didn’t lie in Disney’s new design, however, but in people’s reaction to it. Simply put, if you don’t try to squint and scrutinize every little detail, Merida’s new design isn’t all that different from her old one—a bit more cartoon-like, maybe, but you can still recognize it’s Merida. So her new dress makes her look a little slimmer. It’s not that different. It doesn’t change the message of her movie. What’s the big deal? “Merida was the princess that countless girls and their parents are waiting for—a strong, confident, self-rescuing princess ready to set off on her next adventure with her bow at the ready,” reads “Keep Merida Brave,” a Change.org petition demanding that Disney reconsider Merida’s new design. 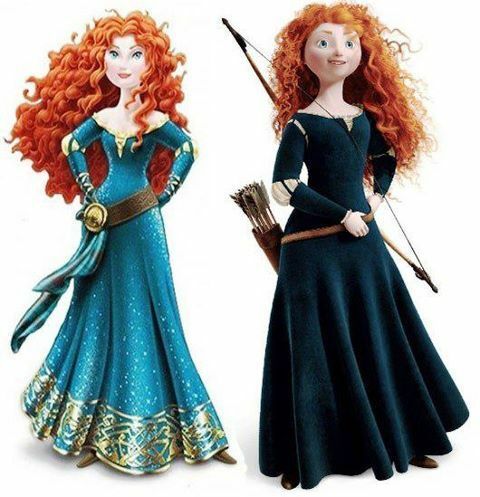 How exactly does Merida’s new design change her character? If you look at her new design in terms of art style instead of in terms of subliminal messaging, the answer becomes clear: Disney had to make her look at least a little similar to the other princesses if she wasn’t going to stand out in the lineup. Merida’s not the only one who got a makeover either; all the princesses did—even older ones like Cinderella and Aurora. Why should Merida get special treatment and stay the same? But people feared what sort of message Merida’s new design would send to little girls everywhere. Merida, who so nicely taught children that marrying Prince Charming isn’t everything, apparently told little girls, with her new design, that they needed to be slim to be considered beautiful. But wouldn’t people rather assess her character based on her movie rather than the merchandise surrounding her? These critics don’t give children enough credit. When I was a little girl, I too was enamored by the glamorous Disney princesses. Being a girl of Indian descent, I think it’s safe to say that I don’t bear a strong physical resemblance to any of the Disney princesses, except maybe Jasmine, but even that’s pushing it. Did that stop me from dressing up as Aurora, Belle, and Mulan for Halloween as a child? Not at all. It never occurred to me that I was different in any way from the princesses because I looked up to them for their character rather than their looks. I wanted to be strong and resilient like Mulan. I wanted to be smart, caring, and compassionate like Belle. Just because I didn’t look like them didn’t mean I couldn’t be like them. And that’s still the case today. In Disneyland, just try to count how many little girls of all races and sizes dress up as princesses such as Cinderella and Aurora. How many of them do you think care that they don’t look exactly like the princesses? The controversy surrounding Merida’s new—now discarded—design ultimately boils down to political correctness. In other words, the constant need to tiptoe around people’s feelings and the fact that people live in constant fear of offending the people around them. Body image and self-confidence have always been important, even to college students like us, but I think we’re being too sensitive regarding Merida’s new design and reading too much into it. The fact is, it isn’t Disney that’s perpetuating the notion that skinny is beautiful; it’s the people who took issue with the design and demanded that Disney change it. What was it that Belle taught us? To not judge a book by its cover and to accept everyone regardless of appearance or size. We should all do the same for Merida. We should follow the morals these same Disney princesses taught us in their movies and remember one very important thing: that Merida—and, by extension, any other Disney princess—is not defined by her looks.